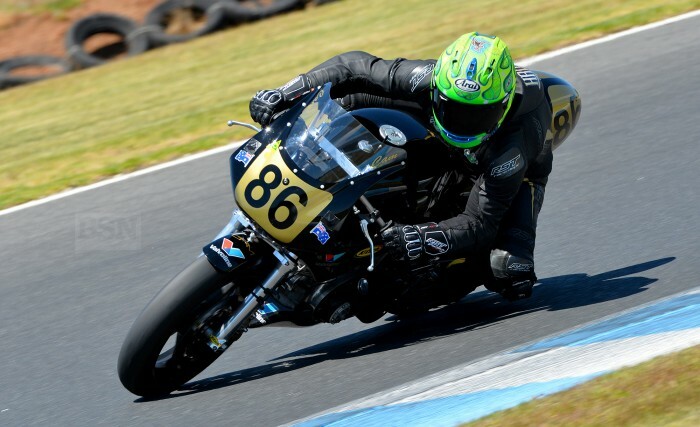 Isle of Man TT Superbike and Superstock race winner Cam Donald didn’t have the best of days at the Phillip Island during the non-official practices for the International Classic. Donald, 41, didn’t get to do any testing ahead of this weekend, as he broke a finger while riding his dirt bike before Christmas. Donald has had a splint for a month, which enabled him to do any testing what so ever. Throughout the four fifteen minute sessions today, Donald and the K.H. Equipment/K-Tech Suspension team had some teething issues with the bike, as they have some new bits and pieces on the Irving Vincent machine. However, so far it hasn’t worked out that well for the team, which is based in Hallam, 102km from the ‘Island’. “It’s a long four days, so you have to get the bad luck out of the way early and hopefully we’ll get back on track tomorrow with the bike running right,” Donald told Bikesportnews.com. “It’s shame we have had these issues today, as we learnt nothing. We have no real information to go off heading into tomorrow. We have just spent the day trying to get the bike to run correctly. At the end of the day, we are not the only ones as old bikes always seem to find new problems,” added Donald. This simply means that Donald will just have to keep chipping away and see what he can come up with in the morning for the first qualifying session. Another factor for Donald and other riders had to deal with today was the extreme heat, which was into the mid-thirties, and tomorrow is set to be even hotter. Did Donald have any dramas with dealing with the heat? Answer, no issues at all. This was put down to his years when he spent racing in Asia, which Donald says it certainly helps with days like today. Barring any issues tomorrow, Donald says for qualifying will be all about gritting his teeth and put on on the line and try and get up on those first couple of rows for the four races across this weekend. The Irving Vincent has magnificent corner speed, but it’s no secret that he and his stable mate, Beau Beaton do struggle a bit with top speed on the straight. So for Donald and Beaton, they need to get a good qualifying position and get off the line with the leading pack which should help them get towed along a bit in the races. “It goes without saying, qualifying is very important. It all comes down to tomorrow,” finished Donald.